My knowledge about horses three decades back was nearly zero like any other fellow Keralite (Person of origin from Kerala State, India). Kerala is one of the few states in India where horses are hardly used from time to time - in wars,in hunting,means of transport or sport. There could be stray exceptions but sighting a horse in the state to this day is rare albeit that of an elephant is common! As such my knowledge whatever I had about horses was more bookish. My early life in Qatar gave me a breaking chance to enjoy the horses and races where it has a prominent place in sport. All along in history horse played a major role in Arabian lands.Steadily I started to learn about sporting horses of Europe as well.It was a flood of new information for me about the horses and upkeep of them when Al Balagh, the firm where I have been working, got an opportunity to build a massive, modern and sophisticated Equestrian Complex of Olympics standards for the Asian Games 2006 at Doha. My limited exposure could be only a 'tip of the iceberg' on the subject, but it readily prompted me to add an exclusive veterinary section dealing with equestrian equipment to our Medical and Scientific Division of the group soon after. During a recent trip to Europe, while in Austria, sight of an ornate life size statue of a horse with choicest crystals was indeed a surprise. But when I learnt that what they have exhibited is a replica of a horse which lived in India 440 years back lifted my eye brows- that too in a place least expected- Swarovski headquarter's museum at Innsbruck!! Award of the contract of the Equestrian Complex at Doha to us by Qatar Olympic Committee ten years back was a professional challenge as well as an opportunity for us in a new arena.Being an Asian Games project it was an exposure to Olympics standards set to achieve against specific target in time. Finally when we accomplished it successfully in time and quality, it was a mile stone in our corporate growth. It opened a flood gate of equine related info for me as well.How well and carefully a race horse is bred,looked after and trained was all news to me.A CT scanning machine and swimming pool exclusive for horses was beyond my comprehension then.Also I got a chance to interact with a professional in a new trade in my corporate life- a Footing Specialist,an expert in arenas,that too of Olympics standards!! Qatar is a sporting nation,only country as far as I know,where a day- the second tuesday in the month of February of the year- is a declared holiday marking National Sports Day.All sorts of sports and games are encouraged among the nationals and expatriates alike where world class facilities including those for horses are already in place and continues to be either upgraded or built new to meet futuristic needs. Dazzling world of crystals exhibited at Swarovski museum in Austria was expected but how they have done that was beyond my imagination- set below a grassy hill with a funny face of a giant as water fall comes out of the mouth! Headquartered at Innsbruck,Austria Swarovski produces their products in different parts of the world including India.The museum,an architectural marvel with glittering displays well done,was opened in 1995 for the 100th year anniversary of the group. The least expected exhibit there by me- as the museum guide announced- was statue of an Indian horse decorated with the best crystals dangling all over the body! Maharana Pratap was a Rajput ruler from Rajastan,India.His favorite horse was named 'Chetak'.Contemporary to Mughal emperor Akbar in 15th century who was constantly busy expanding his domain, Maharana had a series of conflicts with him while protecting his motherland. Chetak who was a loyal constant companion of the king is known in India through the ballads of Rajastan to this day. Chetak was a Kathiawari breed. Grey in colour,comparatively small built to other breeds, Chetak was outstandingly brave,intelligent and loyal.The story is that Chetak bearing a false elephant trunk to look like a baby elephant, so that adult animals would not attack instinctively, along with the master charged the elephant of the commander in chief of the elephant of the Mughal army. 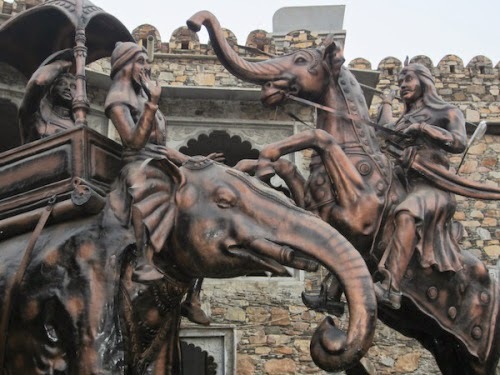 That was in the battle in 1576 in the battle of Haldighati.Rajput king lost the war while Chetak was fatally wounded but bravery of both is told and retold in Rajastan. Chetak's name is commercially used in modern India.Italian Piaggio successfully used the name for its scooter manufactured in India in collaboration with Bajaj. Indian air force has named its first indigenous helicopter as Chetak. Indian Railway has named a fast train from Delhi to Udaipur(Rajastan) as Chetak Express. There could be more such examples which I might have missed.All these are commercially used in India but not outside the country. Why Swarvoski chose an Indian horse instead of an European or Arab one? There are a number of much more famous horses in the world which have legendary history.Why Bucephalus- black stallion of Alexander the Great or Marengo,horse of Napoleon Bonaparte or anything similar was not chosen, paving the way for an Indian horse?None of the world famous and popular horse breeds like Thoroughbred, Arabian or American Quarter was not selected but why? My own answer to my own doubt is that maximum visitors and buyers in the museum in Austria must be from India these days! !Definitely I can go wrong as well! !